"Thai vendors embrace QR" summarizes Gregory Morrissey, writer. Bangkok's famous street-food vendors have joined the digital revolution. They are embracing payment via Quick Response (QR) barcodes that can be read using smartphones. Vendors in the capital are offering digital transactions after the Bank of Thailand (BoT) last week gave the green light for five banks, including Bangkok Bank and Siam Commercial Bank, to start using electronic payment systems with QR codes. "The global trend is towards a 'cashless society.' It's convenient and there is proof of transaction. The QR code system is practical in Thailand because vendors don't have to invest too much," Somsak Khaosuwan, Deputy Permanent Secretary of the Ministry of Digital Economy and Society, told Reuters. 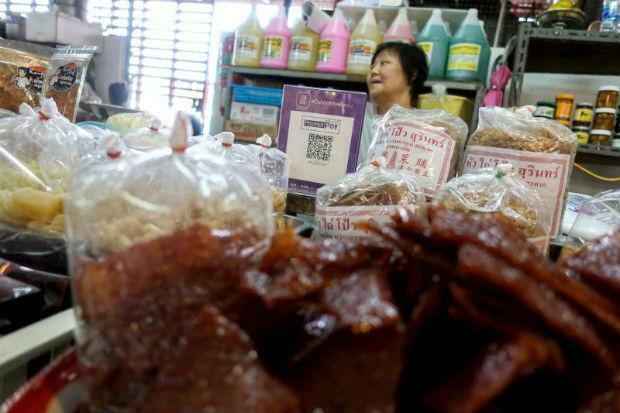 At one Bangkok market, vendors said the QR codes were proving popular. However, some shoppers still prefer to use cash, particularly those who are less tech-savvy. "I don't need to worry about finding change. But some customers, especially older people, find it a bit of a hassle," said Kitti Khoonphisitwong, 40, a dried-fruit vendor. Shoppers in their 20s and 30s were more likely to use the system.